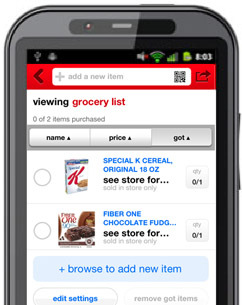 The Target shopping app, available for both android and iPhone users, is a great resource that can save you time and money by offering Daily Deals, Weekly Ads, a Barcode Scanner and more. But one of the features I find really useful, is the TargetLists. More than just a resource for baby shower or wedding registries, TargetLists allows you to create a list for any person, event or occasion. You can create shopping lists or wish lists for yourself, gift lists for family and friends, or even a list for holiday gifts you need to return. The possibilities are endless and there is no limit to the number of lists you can have in the app. If you haven’t yet downloaded the Target app to your smartphone, go HERE and choose your device. Or text “APP” TO 827438 (TARGET) to receive a download link. Note: Message and data rates may apply. Once you have the app, you’ll need to sign in to use the TargetLists feature with the email and password you created to set up your account. Just pull on the tab at the bottom of your screen and tap on Lists and Sign In. To create your first list, tap on the + sign. Then name your list and tap Create. You’ll notice that your list is now added to the main screen with the registries. You can open it at any time by selecting it. You can add items either by using the search window at the top, by browsing, or if your smartphone has a camera, you can tap the barcode icon at the top of your screen. In my book, this beats handwriting a shopping list any day! If you choose to browse, a list of departments will come up. Each department is then organized into categories and even sub-categories if need be. To find what you’re looking for, pick the category and a price list comes up with details like whether its sold online, in the store or both. Tap on the item again, and it will tell you more details, what aisle its in if its sold in-store, and what stores near you have it in-stock. This is also where you can select the item and add it to your list. To select more items, you can use the back arrow at the top to find the screen you need. You can also pull on the tab at the bottom and select “Lists” again if you want to review your list. I created a list just for Target Grocery to help me get my coupons organized before I shop. And now, I don’t have to make a new list each week. I just open my grocery list and check it twice! I can edit at any time – whether its to add items or remove them. To remove an item, just tap on the circle to select the item and then tap on “remove got items”. You can even choose to delete the list from this screen or change the title by editing the settings. You can sort your list by name, price or even by those items you have already gotten. The barcode at the top can be shown to your cashier at checkout after everything has been scanned and it will automatically update your list with purchased items. With holiday clearance coming up, you could make a wish list for all the items you hope to find on clearance. We all know it pays to be organized and get there early for those clearance markdowns. You can use my Christmas Clearance Prep List to help you make your wish list and grab all your coupons. If any of you have had experience with using TargetLists, please feel free to share any tips or advice in the comments that may be helpful to other readers. Just one question: What does “the barcode at the top can be shown to your cashier at checkout after everything has been scanned and it will automatically update your list with purchased items” mean? Does that mean the cashier scans the barcode and the list syncs with the register? Kelley – Thank you so much! That’s awesome.